Mack succumbed Monday to heart failure at a hospital near his home in Walterboro, South Carolina, the producer said. He had been ill for some time. “It was a pleasure to know you & rock with you,” tweeted LL Cool J, who performed on Mack’s remix for “Flava in Ya Ear” with Notorious B.I.G., Busta Rhymes and Rampage. The New York City-born rapper hit it big in his debut album for Bad Boy, “Project: Funk Da World,” which also generated a second single, “Get Down,” Billboard noted. To read more about Craig Mack’s life and music, click here. NEW YORK (AP) — He’s been a rapper, actor, singer, entrepreneur, record producer and clothing designer. Now Sean “Diddy” Combs has taken on a new job as the founder of a charter school in New York City’s Harlem neighborhood. Combs announced Monday that the new school will be named Capital Preparatory Harlem Charter School and it will open in the fall, according to the Associated Press. The venture has been in the works for five years. The school will be overseen by Capital Prep leader and founder Dr. Steve Perry, who started Capital Prep Magnet School in Hartford, Connecticut, in 2005. Combs and the board have hired Orlando, Florida-based educator Danita Jones as the principal of Capital Prep Harlem. Combs says creating the school is “a dream come true.” In addition, Combs and Perry have been meeting in secret with community leaders and experts in education to build the program. The school’s board also includes author and spiritual life coach Dr. Iyanla Vanzant, who has worked with Oprah Winfrey in the past. According to Capital Preparatory Harlem Charter School’s official website, the school is a free, public school for children grades 6-12. The extensive program will provide a “year-round, college preparatory education.” College courses will also be available to the students once they reach high school. For the opening year, 160 students are to be enrolled in 6th and 7th grades. The deadline to apply for the upcoming school year is April 1st. It’s a snowy Friday morning as Ericka Pittman, vice president of Combs Enterprises, settles down, coffee in hand, and begins prepping for her busy day in New York City. After traveling on a 2 a.m. red-eye flight, she explains how although she is extremely fatigued, the show must go on. Her successes at major media outlets like Time, Inc. and Conde Nast caught the attention of business mogul Sean ‘Diddy’ Combs, who hand-selected Pittman as vice president of his companies. As Sean P. Diddy Combs’ “Sheryl Sandburg,” Pittman’s creative mind and strategic way of thinking make her one of the best brand developers in the business. As the VP, she sits at the helm of the executive team, overseeing the growth and direction of the Combs portfolio and overseeing Combs’ businesses, including Aquahydrate, Combs Wines & Spirits (CIROC, Deleon Tequila), Revolt TV and Sean John. Besides her love of her career, Pittman has invested herself in propelling women from different walks of life to reach their highest potential. As a part of Women’s History Month, we followed her throughout her day in New York City as she discussed her journey and crucial advice to all Millennials. Sidnee Michelle: What is your favorite thing about being Ericka Pittman? Ericka Pittman: My heart. I have a very gum-drops-and-rainbows approach to life. I’m one of those people who will put a coin in an expired meter so no one gets a ticket or towed; I’m one of those types in my heart and in my core. Most people who have known me and know my heart see that side often, but I feel in business I’m not able to be that person 100% of the time – so I try to keep that balance. SM: What is the most fulfilling aspect of being a woman of your stature? EP: That giving back element – when I elevate those around me, it just feels good. For me, I try to give back even in business. Doing well by doing good is very important to me. The same way I was blessed in my career, I try and pass on the good karma by doing everything in my power to advance the next woman that deserves it. SM: What influence does Sean P. Diddy Combs have on your career? What did he teach you early on? EP: Sean Combs has taught me to utilize every tool in my tool box, to make the impossible possible. He taught me how not to take no as an answer – that no is the beginning of negotiations to get what you want. He also taught me to be strategic about how you go about getting what you want – with class elegance urgency and fine execution. If I didn’t have that leadership in my life early on, I’m not sure I’d be where I am today. SM: Besides Sean P. Diddy Combs, who are some of your influences and mentors? EP: Just recently I started to acquire female mentors. I discovered as I was growing in my career there was a need of a feminine aspect and guidance in business that I was lacking. I’ll walk into a high intensity board room like a bull in a china shop – stern and aggressive, because that’s what I learned from my male mentors and counterparts. I realized that I had to learn how to finesse my approach from female mentors like Susan De’Passe , who worked with Motown and had hands in discovering the Jackson 5. SM: How did you rise to the top in such a male dominated industry? EP: I think I there is a certain level of integrity I have. I demand a certain amount of respect because of the way I present myself in business and personal life. You have to conduct yourself a certain way in both realms – while still being able to maintain your identity and a strong and powerful woman. SM: How do you maintain a healthy work/personal life balance? EP: It’s tricky at this company because of the brands/companies I work with. Celebration is our core tenant, so we do awesome activations, parties and events. Things like those bleed into my personal time because of the frequency and late hours of these events. To combat that I think it’s important to be 100% present in the moment that you are in. Filed under: AQUAhydrate, Combs Enterprises, Conde Nast, Ericka Pittman, New York City, Revolt TV, Sean "Diddy" Combs, Time Inc.
Sean “Diddy” Combs and Mark Wahlberg have pledged to donate 1 million bottles of their AQUAhydrate water to the residents of Flint, Michigan, until the city’s water problems are solved. The company says it’s sending 5,000 cases initially by Wednesday, and will continue to provide bottles to residents up to 1 million, reports the Associated Press. High levels of lead have been detected in Flint’s water since officials switched from the Detroit municipal system and began drawing from the Flint River as a cost-saving measure. 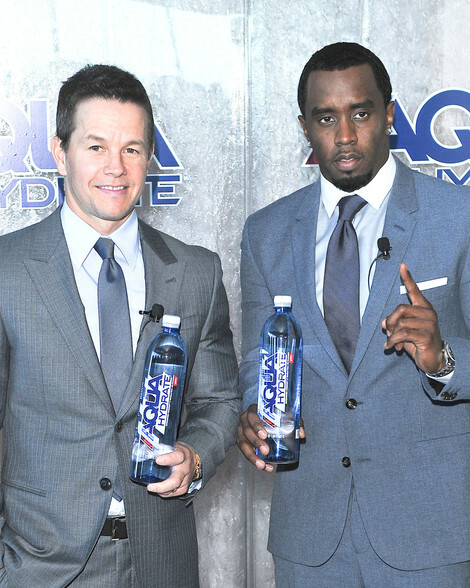 Wahlberg and Combs first invested and became the face of the Los Angeles-based bottled water company in 2013. Big Sean, Cher, Eminem and Wiz Khalifa are among other celebrities who have pledged support and donations to assist Flint’s water crisis. Sean ‘Diddy’ Combs may have come from humble Harlem roots, but that did not stand in the way of his growing an estimated personal fortune of $580 million, according to Forbes magazine. Now giving back to inner city youths with similar entrepreneurial dreams, the media mogul has donated $250,000 to an organization that helps low income children learn the brass tacks of business. Last Thursday at the Times Center in New York City, Combs presented a $250,000 check to the Network for Teaching Entrepreneurship (NFTE), an international non-profit dedicated to teaching underprivileged young people to think like entrepreneurs. Combs did not merely stop by and drop off some cash. Before the gala where his gift was announced, the rapper and clothing impresario spoke in depth with NFTE finalists in a national business competition. The 2013 NFTE National Youth Entrepreneurship Challenge included 39 students representing 35 different businesses. Winners Toheeb Okenla and Jesus Fernandez won the $25,000 first prize for their idea, T&J Soccer, which produces a special sports sock containing pockets for shin protectors. The music producer and branding expert was on hand to personally mentor NFTE participants and nurture their business ideas at the benefit. “I wish I had a NFTE when I started. That could really have showed me the importance of combining what I learned in school, and then applying that to my street smarts,” Combs said of working with the group. What is Combs’ best advice for young business leaders of the future? Lorraine Vivian Hansberry, born May 19, 1930, was an African-American playwright and writer. Her best known work, the play A Raisin in the Sun, was inspired by her family’s battle against racial segregation in Chicago. Hansberry was the youngest of four children of Carl Hansberry, a successful real-estate broker, and Nannie Louise Perry who was a school teacher. In 1938, her father bought a house in the Washington Park Subdivision of the South Side of Chicago, violating a restrictive covenant and incurring the wrath of many neighbors. The latter’s legal efforts to force the Hansberrys out culminated in the U.S. Supreme Court’s 1940 decision in Hansberry v. Lee, holding the restrictive covenant in the case contestable, though not inherently invalid. Hansberry attended the University of Wisconsin–Madison, but found college uninspiring and left in 1950 to pursue her career as a writer in New York City, where she attended The New School. In 1951, she joined the staff of the black newspaper Freedom under the auspices of Paul Robeson, and worked with W. E. B. DuBois, whose office was in the same building. A Raisin in the Sun was written at this time and completed in 1957. In 1953, she married Robert Nemiroff, a Jewish publisher, songwriter and political activist. She later joined the Daughters of Bilitis and contributed two letters to their magazine, The Ladder, in 1957 under her initials “LHN” that addressed feminism and homophobia. She separated from her husband at this time, but they continued to work together. In 1959, Raisin In The Sun debuted, becoming the first play written by an African-American woman to be produced on Broadway. The 29-year-old author became the youngest American playwright and only the fifth woman to receive the New York Drama Critics Circle Award for Best Play. A Raisin in the Sun was revived on Broadway in 2004 and received a Tony Award nomination for Best Revival of a Play. The cast included Sean “P Diddy” Combs as Walter Lee Younger Jr., Phylicia Rashad (Tony Award-winner for Best Actress) and Audra McDonald (Tony Award-winner for Best Featured Actress). It was produced for television in 2008 with the same cast, garnering two NAACP Image Awards. While many of her other writings were published in her lifetime – essays, articles, and the text for the SNCC book The Movement, the only other play given a contemporary production was The Sign in Sidney Brustein’s Window. The Sign in Sidney Brustein’s Window ran for 101 performances on Broadway and closed the night she died. After a battle with pancreatic cancer she died on January 12, 1965, aged 34. Hansberry’s funeral was held in Harlem on January 15, 1965. Paul Robeson gave her eulogy. The presiding reverend, Eugene Callender, recited messages from James Baldwin and the Reverend Martin Luther King, Jr. which read: “Her creative ability and her profound grasp of the deep social issues confronting the world today will remain an inspiration to generations yet unborn.” She is buried at Asbury United Methodist Church Cemetery in Croton-on-Hudson, New York. WWE and Sean “Diddy” Combs today unveiled a new global anti-bullying public service announcement encouraging kids to stand up to bullying. It will begin airing tonight during Monday Night Raw. The music mogul will serve as an ambassador for Be a Star, the anti-bullying initiative co-founded by WWE and The Creative Coalition to encourage young people to treat each other with tolerance and respect.